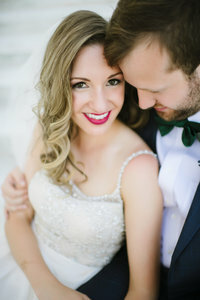 Marta & Dan’s Pine Knob Mansion wedding is one I’ll forever remember. Marta’s kind hearted soul combined with Dan’s gentleman vibe was absolutely the perfect match! The day began with Marta getting ready while Dan got ready. Their day was filled with so much love, special traditions, laughter, tears, joy, and surprises that it turned out to be an amazingly spectacular day! I love documenting moments that are unusual and it was really special to be apart of the moment Marta and Dan had prior to the ceremony. After the getting ready moments, gift exchanges with family members, and tearful sentiments with parents, we were off in a hurry to the ceremony at Our Lady of Czestochowa Catholic Church in Sterling Heights, MI. The ceremony, one of my favorite moments to witness, included special Catholic traditions. It was a beautiful sight to see two families become one and traditions come together. And it wasn’t long before we headed off to The Mansion at Pine Knob to capture the bridal party with Marta and Dan! The bridal party was awesome and THOSE COLOR TONES! We are super obsessed with them! They were a fun bunch of people who were having a blast with Marta and Dan. It was hilarious and enjoyable to document them all, but the true photography bliss came with the bride and groom. Marta & Dan when together had an incredible sense of passion. I think you’ll agree when you see the images of the two of them together. Makes my heart skip a beat! We headed down to the Pine Knob Mansion for their reception, where the guests mingled over cocktails. Marta & Dan were announced and had a special trodden following and the rest of the night is history!